Quality stitched & handcrafted, this 13-inch messenger bag is durable, spacious & made of 100%, genuine leather. Eco-friendly & stylish. Plus, wear it multiple ways. A must-have for school or office. Looking for the perfect blend of style & function? Upgrade to the Leather Messenger Bag by Rustic Town. Handmade by skilled artisans, it's crafted of genuine leather and expertly tanned for a durable, yet flexible finish. Worried about a funky smell? Don't be. Our included humidity-absorbing pouch ensures your satchel arrives clean & fresh. Business messenger bags are usually dull & boring, but your leather briefcase features an enviable, vintage look with natural markings found only in genuine leather. Tan with contrasting button details, its style is understated, yet hard to ignore. Great for both men & women. Prefer a shoulder bag? A crossbody? Wear it either way thanks to a long, adjustable strap. Even has an ergonomic handle. Use to carry everything from a laptop, MacBook or tablet to notepads, paperwork & textbooks. 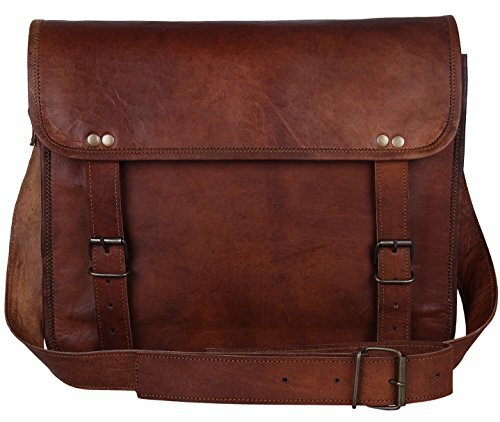 Leather Messenger Bag for Men & Women, Vintage Business Briefcase for Laptops & Books ~ Handmade, Rugged & Distressed ~ Genuine Retro Satchel ~ Great for Office, College, School & More, 15 Inch Stylish Design: Have a boring briefcase? Not anymore. Your leather business bag has raw character that improves with age. Oil rubbed & distressed, it's vintage at its best. Built to Last: This leather satchel features quality stitching, brass buckles & strong zippers. Ultra-durable, reliable & secure. Even has heavy-duty canvas & Velcro strap to protect contents. Keep Essentials Handy: With 1+ 2 compartments & 2 inner pockets, your 13-inch shoulder bag is perfectly sized for tablets, laptops, notebooks & more. Ideal for office, college & school. Multiple Carry Options: With a convenient, adjustable shoulder strap & sturdy handle, this brown laptop bag can be worn on shoulder, cross body or in hand. Great for bikes & buses.